Thousands of teachers, social workers, union members and more took part in a march Thursday against Mayor Michael Bloomberg's plans for wide-ranging budget cuts -- and against the Wall Street bankers they blame for the city's budget woes. Activists reported that the NYPD had arrested several marchers, but the demonstration took on a mostly joyful cast, with colorful signs, raucous chants and even a stilt-walker. The May 12 Coalition's organizers promised a big turnout of more than 10,000 marchers, and while immediately pinning down the crowd's size proved difficult, at least that number turned out. Demonstrators from the United Federation of Teachers (UFT) alone, which faces more than 4,000 teacher cuts if Bloomberg's budget is enacted as is, numbered in the thousands. Rev. 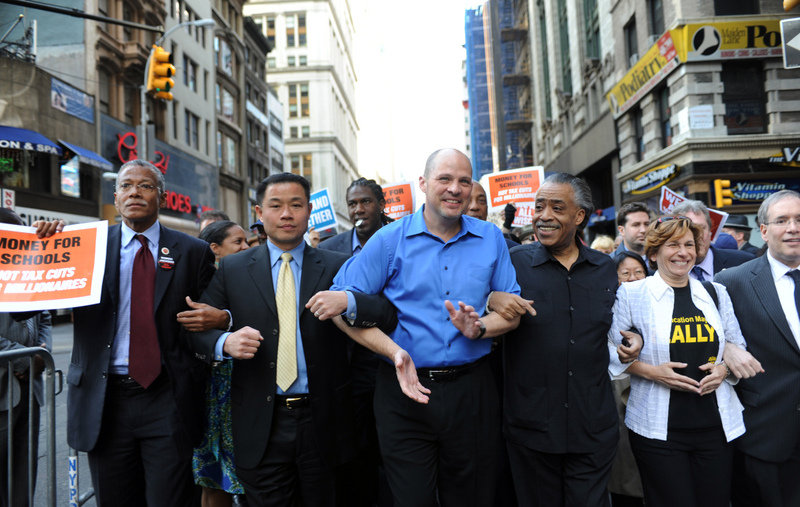 Al Sharpton, UFT President Michael Mulgrew and an array of city councilmembers and state elected officials laid the blame for the budget cuts squarely at Bloomberg and Wall Street's feet. "Wall Street recovered, hedge funds got stimulated, and now they want to lay off teachers and close day care centers," Sharpton said. "We're going where they sent the money," he said of the march. Organizers claimed the city could prevent budget cuts by reinstating the state's "Millionaire Tax," ending subsidies for large companies that failed to meet job-creation targets and renegotiating city contracts with the big banks. They estimate their proposals could save New York City $1.5 billion and billed the event as a demonstration not just against the Bloomberg budget plan but also as an effort to "make the banks pay." Randi Weingarten, president of the UFT's parent organization, the American Federation of Teachers, noted she has traveled the country in the past few months fighting against teacher cuts in states across the nation. "I never expected to come home to see New York act like Wisconsin," she told the crowd. Weingarten, like many others at one rally stage dedicated to the teacher cuts, disputed the Bloomberg administration's argument that it cannot dip into a rainy day fund to pay for teachers' salaries. "There are lots of places across the country where there are real budget crises," Weingarten said. "New York is not one of them." Ralliers included more than just teachers. A diverse coalition of groups took part in organizing the event, from the Coalition for the Homeless to the Communications Workers of America to HIV/AIDS advocacy organization VOCAL-NY. Rev. John Magisano, a pastor at a Chelsea church, said he was worried the cuts forecast in the administration's budget could harm his neighborhood's seniors and gay community. "Everyone's feeling the pain but them," he said of the country's large banks. The mayor's spending plan would cut $30 million dollars from programs for the homeless. Advocacy group Coalition for the Homeless attended the march in protest, along with members of the population they serve. "I'm out here because we have no home," said Kassandra Ward, who pushed her son in a stroller at the rally. She said she lost her job and home as a result of the recession, and was worried that the mayor's budget would make her situation worse. "The city and the banks, they're taking out money... they're not doing anything." Devon Murphy, a teacher at Passages Academy, said he attended "in solidarity with all the teachers across New York City." He was not sure if the mayor's cuts might hit him and his colleagues, but wanted to come anyways. "I don't have a clue if it's going to affect me," Murphy said, "but it will affect some of us. You never know." Some unions have charged that Bloomberg's budget, proposed last Friday, serves more as an opening negotiating gambit than a final word on how many jobs and programs the city will cut. Murphy said he was not sure how serious the mayor was about his cuts. "He's a hard person to read," he added.